FREE OF CHARGE 12 Months AA GOLD Warranty, 12 Months AA Breakdown Cover, 12 Months MOT, FREE OF CHARGE. 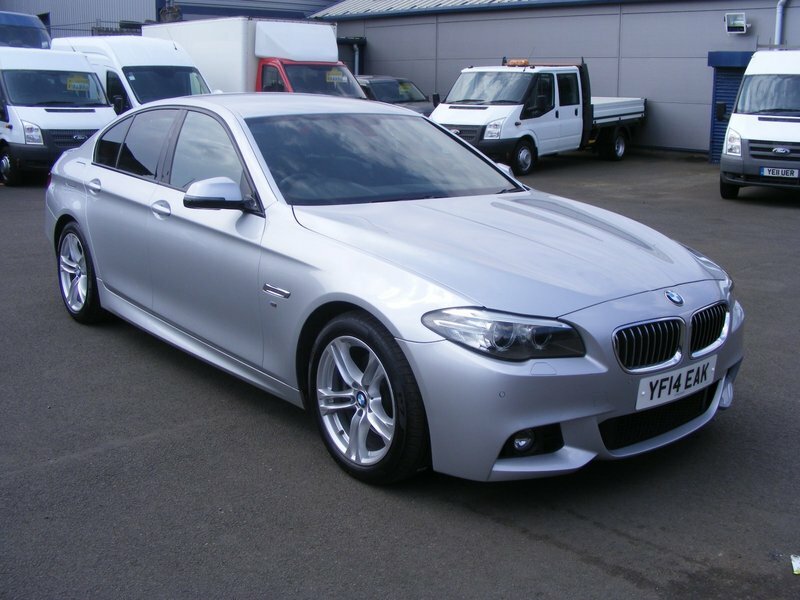 This stunning BMW 520d M SPORT Automatic will come with a full Service, 12 Months MOT, and 12 months AA breakdown cover and a full valet before collection. BMW emergency call, BMW Teleservices, Check control system, Front/rear Parking distance control, Luggage compartment release button in drivers A pillar, Luggage compartment with electric unlocking via key remote control, On board computer, Outside temperature display, Personal Profile, Service interval indicator, Speed limiter. Entertainment, Auxiliary point for auxiliary devices, BMW professional radio/CD/MP3, DAB Digital radio. Exterior Features, Auto dimming rear view mirror, Body colour door handles, Body coloured bumpers, Body coloured door mirrors, Body coloured side sills, Chrome kidney grille with black vertical slats, Electric + heated aspheric door mirrors, Electric front and rear windows with fingertip open/close + anti-trap all round, Fogging sensor for front windscreen, Green tinted heat insulating glass, Headlight range control-electric, Headlight washers, Heated windscreen washer jets, M aerodynamic body kit, Rain sensor with auto light activation system, Shark fin roof aerial, Twin chrome exhaust tailpipes. Interior Features, 12V socket in rear centre console, 3 Spoke M sports leather steering wheel, Anthracite Velour floor mats, Front centre armrest, Front cupholders x 2, Front footwell lights, Front reading lights, Front/rear courtesy lights with soft on/off dimming, Full black panel display, Heated front seats, Illuminated glovebox with lock, Isofix rear child seat preparation, Multi-function controls for steering wheel, Reach + rake adjustable steering column, Rear centre armrest with 2 cupholders + storage, Rear headrests, Securing rings in luggage compartment, Sunvisors with illuminated vanity mirrors. Safety, ABS/EBD, Advanced Head Protection System front + rear, Aluminium brake calipers, Automatic Stability Control (ASC), CBC - (Cornering brake control), Crash Sensor - activates hazard/interior lighting + unlocks doors, Driver/front passenger side airbags, Driver/Passenger airbags (Impact dependent), DSC+, Dynamic brake control, Dynamic Traction Control - DTC, Electromechanical parking brake, Front head restraints with anti-whiplash, Front passenger airbag deactivation, Fuel cut off safety device, Hill start assist, Inertia reel front seatbelts+pretensioners, Occupancy sensor for passenger seat, Rear door child safety locks, Three inertia reel rear seatbelts, Tyre pressure monitoring system, Warning triangle and first aid kit. Security, Engine immobiliser, Keyless ignition, Locking wheel bolts, Remote central locking, Remote control Thatcham category 1 alarm.